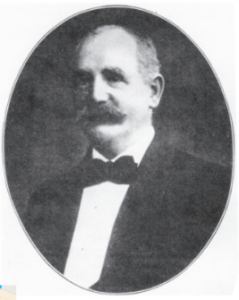 General Society Member John M. Mossman (1846-1912) Began his career in the safe and lock business at the age of 12, in the shop of his father Malcolm. He eventually began his own business in 1878, designing burglar and fireproof bank vaults and safes. He became an eminent authority in the field, with clients including J.P. Morgan and Company, Bank of America and The Metropolitan Life Insurance Company. Throughout his lifetime, he acquired a vast collection of nearly 400 ingenious, historical and rare locks from around the world, that he presented to the society in 1903, with an endowment for their maintenance and exhibition. The extent of the Mossman Collection has described in depth by the 1928 General Society monograph The Lure of the Lock, available for purchase from The Society, as well as the beautiful illustrated American Genius by members John and David Erroll. The John M. Mossman Lock Collection represents one of the most complete anthologies of bank and vault locks in the world, with more than 370 locks, keys, and tools dating from 4000 BC to the modern 20th-century. Many of the examples are unique, made-to-order locks that were not produced in commercial quantities and nearly every lock has protected millions in money and securities. To augment the lock collection. Mr. Mossman donated his notes and scrapbooks, known as the Mossman papers, which have proven to be a valuable resource for the study of locks. “The Lure of the Lock” was published in 1928 and describes each lock in the collection. Collections of various antebellum curios, rare books, prints, flags, clocks, and medals have also been donated by friends and members. Admission to The General Society’s Mossman Lock Museum, which houses the Collection, is a suggested $10 per person. Admission hours are Monday to Friday, 11 a.m. to 5 p.m. The General Society of Mechanics & Tradesmen of the City of New York was founded in 1785 by the skilled craftsmen of the City. Today, this 234-year old organization continues to serve and improve the quality of life of the people of the City of New York through its educational, philanthropic and cultural programs including its tuition-free Mechanics Institute, The General Society Library, and its century-old Lecture Series. Receive news from The General Society of Mechanics & Tradesmen of the City of New York. Yes, I would like to receive emails from The General Society of Mechanics & Tradesmen.